BIRDSEYE MAPLE & WENGE Birdseye Maple and Wenge are a favorite combination of many customers due to the way the darker Wenge brings out the incredible patterns which occur naturally in the Birdseye Maple. 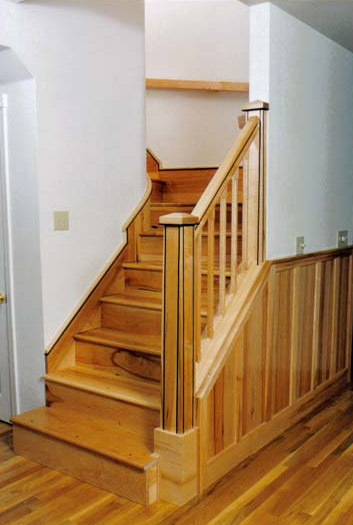 For this customer, John’s Furniture and Cabinets searched extensively and located this Birdseye Maple in Vermont. 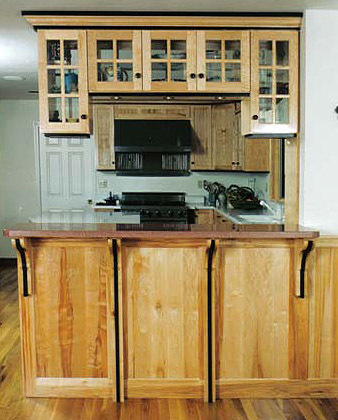 Most of the wood in this kitchen was produced from a single tree resulting in a beautifully consistent pattern, grain and color throughout the room. 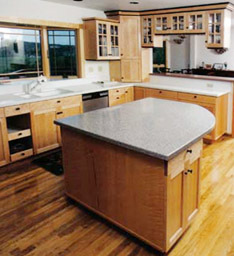 This is a highly custom kitchen with all the finest design features. 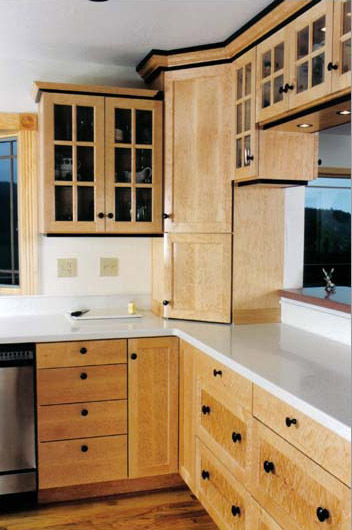 In the base cabinets, side by side drawers are made from single board of Birdseye Maple providing beautiful sweeps of grain pattern and color. 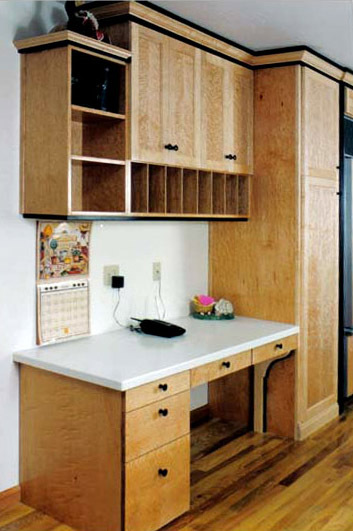 Upper cabinets include open shelving with glass faced doors enclosing wood-edged glass shelves. 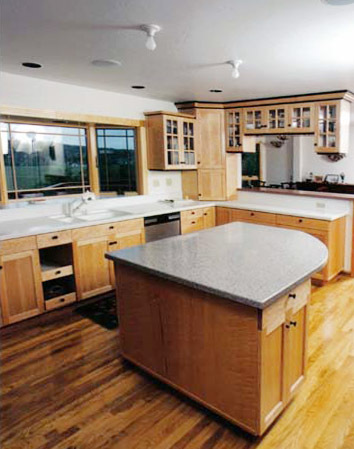 To optimize the open feeling in the kitchen, the cabinetry includes halogen lighting recessed in the top of the cabinets and in the bottom of the cabinets to light the countertops. 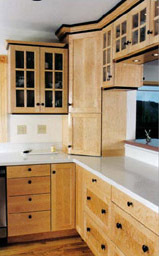 Tall cabinetry design includes appliance garages at both ends of the sink counter and floor to ceiling pantries on both sides of the refrigerator - also finished in Birdseye Maple and Wenge. 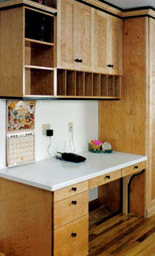 The floor to ceiling pantries feature pull-out shelves and conceal a special compartment with venting for the microwave. Base cabinets feature pull-out shelves and open basket drawers for fruits and vegetables. 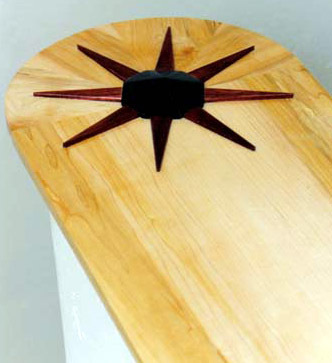 Finishing details include custom corbels in Birdseye Maple and Wenge, custom knobs turned from Wenge, Birdseye Maple crown molding highlighted in Wenge. 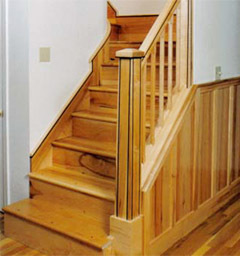 Natural Hardrock Maple compliments the Birdseye Maple as it appears in the wainscoting on the back of the peninsula, the wall leading to the staircase and the stairs, with knoll posts of Natural Hardrock Maple highlighted in Wenge. 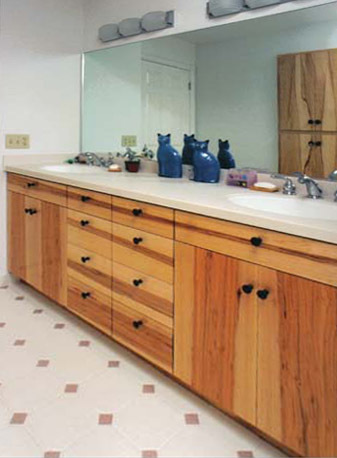 The nearby bath also features single board craftsmanship in the vanity and linen closet, here made of Natural Hardrock Maple which emphasizes the sweeps of wood grain and color.